Los Angeles There has been a lot of talk in recent years about the explosion of the so-called “gig” economy and whether its growth foretells the future of work for Americans. Such a future would mean a series of part-time jobs, no clear employer or employment status, skimpy to non-existent benefits and a narrow path to sustainable work for millions. Some think that the growth of such jobs would be plentiful enough to substitute for automation and deindustrialization. Other have argued that a universal basic income needs to supplement the availability of such work in order to create sustainability. No one ever really knows the future, but it’s always worth some amount of worry, especially when it comes to work. When it comes to the gig economy though a recent report by Lawrence Mishel of the respected, DC-based Economic Policy Institute lays out a comprehensive case that those soothsayers arguing that the gig economy is the future are basically drinking their own Kool-Aid at least when it comes to its current impact on employment. The EPI report looks most carefully at recent data on Uber drivers and their incomes. The bottom line is that Mishel found that once all expenses, commissions, and benefit costs were factored in, an Uber driver was lucky to average $9.21 per hour. When converting the number of part-time and some time almost 850,000 Uber drivers, Mishel was only able to convert about 90,000 into full-time equivalents. Factoring in other studies that put the impact of Uber on total gig economy at about two-thirds, the role of gig work in overall US employment was a relatively miniscule 0.1%. That’s not nothing, but it certainly doesn’t convincingly lay claim to portending the future of work past pure speculation. These findings—and the fact that many Uber and other workers who provide personal services via a digital platform do so on a part-time basis primarily as a way to earn supplementary income—argue for a change in perspective. 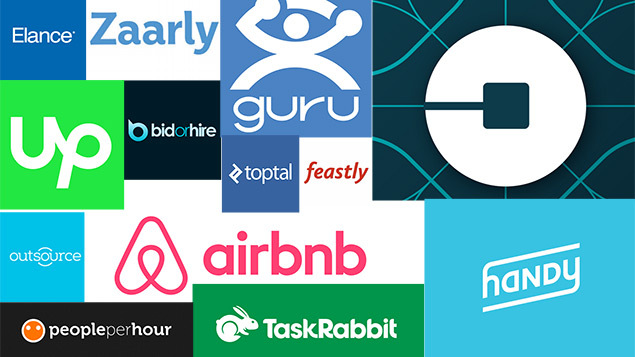 There has been much hype around Uber and the gig economy. But in our assessment, in any conference on the future of work, Uber and the gig economy deserve at most a workshop, not a plenary. If at best it’s only worth a workshop for economists, it’s hardly worth a full beer’s worth of discussion for labor organizers. Informal, contingent, and temporary employment, no matter what they are called in the less than full-time service economy continues to give huge definition to global and domestic employment. These are challenges worth the full-time struggle and effort. Gig employers seeking special favors from legislators and money from investors to allow them free rein over workers have clear interests in promoting themselves as the future of work and everything else, but the rest of us need to brush off their special pleadings and keep our eyes on creating winning strategies for workers struggling now to build power in an array of real jobs in the current economy. This entry was posted in Citizen Wealth, Financial Justice, Labor Organizing and tagged gig economy, workers by Wade. Bookmark the permalink.